People can envision the transit of the 2030s from a bird's-eye view in a new video published by Sound Transit, which is designing $6 billion worth of trackway and stations for Seattle's western side and downtown. People can envision the transit of the 2030s from a bird’s-eye view in a new video published by Sound Transit, which is designing $6 billion worth of trackway and stations for Seattle’s western side and downtown. The footage, based on Google Earth images, accompanies public forums this month. February is one of three phases this year in which agency staff will go out to the neighborhoods seeking design comments. Open-house meetings were held in West Seattle and Ballard last week, to be followed by a session Tuesday night at Union Station, from 5:30 p.m. to 7:30 p.m. An online survey is open until March 5. The corridors are two of eight rail extensions Sound Transit promised in the ST3 tax measure of 2016. Preliminary schedules call for Ballard service by 2035 and West Seattle service in 2030. The Ballard project includes a difficult second transit tunnel through downtown. Seattle’s old and new transit tunnels will cross like a helix at Westlake Station, to form a Ballard-Tacoma line and a West Seattle-UW-Everett line. The latter would be fed by incoming trains from Redmond-Bellevue, via the International District/Chinatown Station, so trains might arrive every three minutes in a core between downtown and either Lynnwood or south Everett. Taxpayers would spend up to $285 million just to get Seattle projects one-third designed and engineered, according to an estimate approved by the transit board. Whether that work succeeds in putting construction on-time and on-budget remains to be seen. Sound Transit’s Northgate-Lynnwood line currently faces expected cost overruns of $300 million or more from Northgate to Lynnwood, despite voter approval nine years ago, and its final design is still being revised. 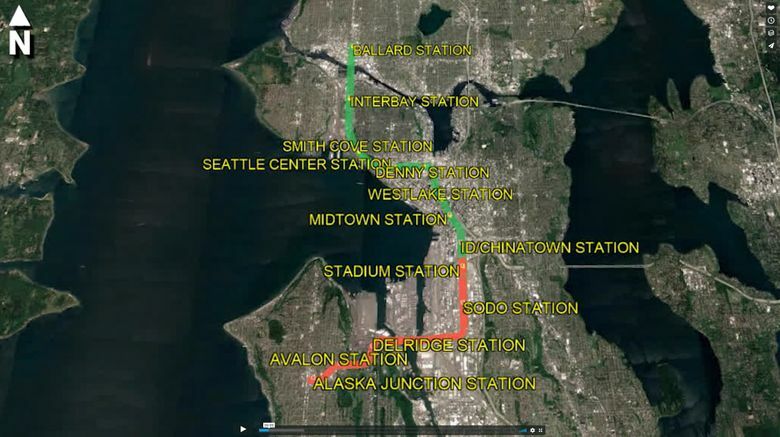 Elevated tracks would run 55 feet over Interbay, in the “representative alignment” to Ballard unveiled in maps last week, to the surprise of some of the 150 people attending. A coalition and small businesses continue to seek a Salmon Bay tunnel, instead of a high drawbridge landing at a 15th Avenue Northwest elevated station. A drawbridge, 70 feet over water, could open four times a day, according to Cathal Ridge, central corridor director. West Seattle residents offer mixed views over whether to accept elevated trackways, or insist on a tunnel. A tunnel would reduce blight and house condemnations, but make it difficult to build the promised Avalon Station, on the hillside between planned Alaska Junction and Delridge stations. Tomasz Biernacki, calling himself “Avalon Tom,” has produced his own visualizations of what elevated tracks might look like climbing into West Seattle, based on existing tall columns in Tukwila. “I hope the neighbors will agree with me to fight for a tunnel,” he said last week. Sound Transit staff say it’s too early in design for them to publish official renderings. However, Ridge revealed that tracks over the Duwamish Waterway are expected to match the upper West Seattle Bridge, about 150 feet high, and run south of the bridge along Pigeon Point. Sound Transit doesn’t need that much height for ship clearance — but would build tall columns and stay tall continuing west, so as to avoid steep climbs and drops as trains go between the river and the peninsula, Ridge said.